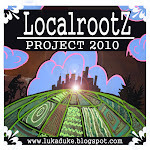 Localrootz Project: Buzzing Bees, Garlic Shoots and Planted Peas. Buzzing Bees, Garlic Shoots and Planted Peas. 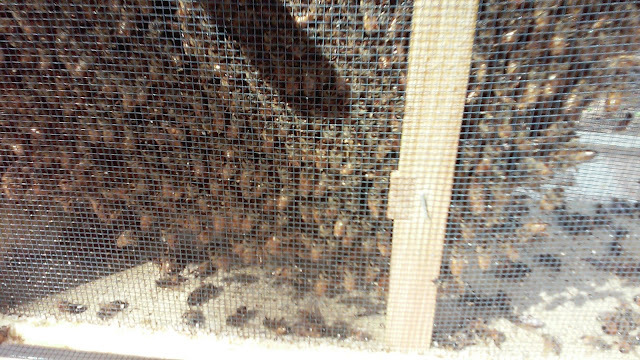 So as promised in the last post... the bees arrived this weekend ! We got a supply of Italian bees from Backwoods Bee Farm in Windham. The hive consist of about 10,000 bees and a marked queen. 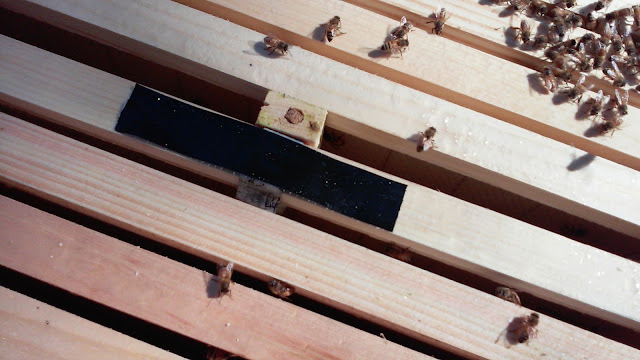 The mark is put onto the queen with a marker prior to delivery to help newbie beekeepers like ourselves with locating the queen once she is released into the hive. I say once she is released because she comes in a separate little box that is inside the cluster of bees in the package. It isolates her during the journey. The hopes are that the queen will be healthy and the hive will accept her once she makes her way out of her cage and the magic of the hive begins. The mark is white this year and it also helps beekeepers remember how old the queen is as there is language of color coding that happens from year to year. The queen has the most important role of the hive, without her there will be no reproducing and growing the colony into a healthy 30,000 plus bees needed to thrive and do what bees do best, pollinate and make honey ! All the tools ready for hiving the bees. Sugar water, frames with foundations, the inner cover and of course the hive roof. 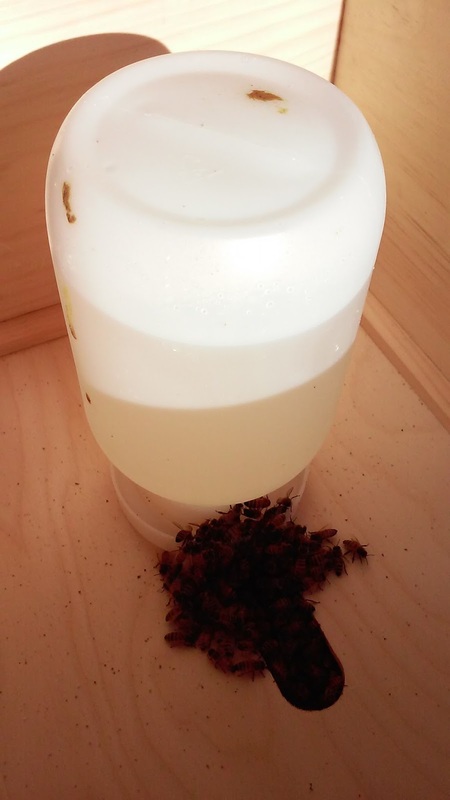 So the key to hiving a package is to pry the lid off, inside there is a metal can that is filled with sugar water solution that keeps the bees fed during the journey. Wedged in between the can and the opening is a metal tab that is attached to the queen cage. After prying off the lid and removing the can I brushed the cluster of bees off the queen and set her aside while I gave the rest of the package a good shake into the prepared hive body. 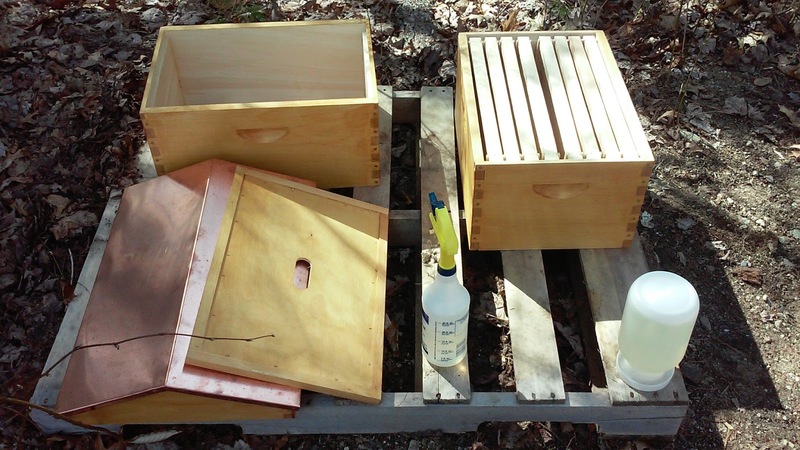 When I shook the bees from the package into the hive I had the middle four frames set aside. 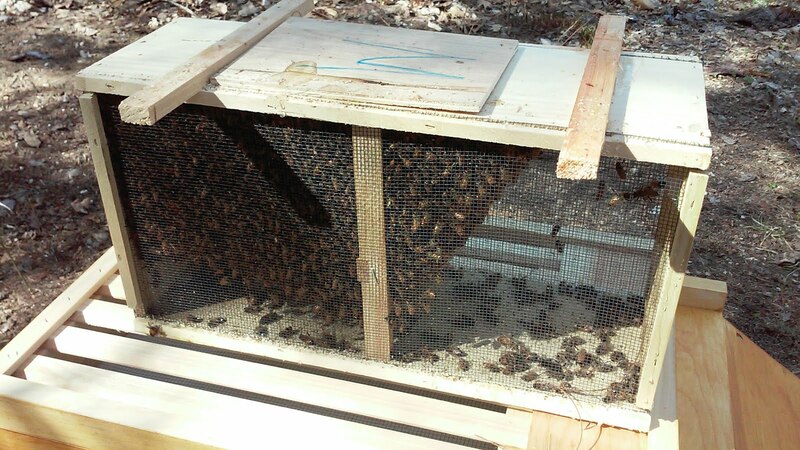 I then proceeded to gently slide the frames into place and wedge the queen cage in between the middle two frames using a piece of duct tape to make sure the cage stayed in place. Before putting the queen cage into the hive I removed the bottom cork from her cage... it has another plug behind the cork that is made of sugar. the idea is the queen will chew her way out and the colony will chew their way in and hopefully when the interaction finally happens everyone will be happy to see each other and the process of rearing new brood will begin. A healthy queen will lay 1500-2000 eggs a day and within three weeks they will hatch into full grown bees ready to work work work ! The whole hiving process took around 15 minutes and there were lots of bees buzzing about but I wasn't overly nervous as they seemed very playful and happy to be free to buzz about on a warm sunny afternoon. Here you can see the queen cage with the cork still in the top, the sugar plug is on the bottom side where I took out the cork. Ill be opening the hive on Monday to see if she has made it out yet. Its very important to monitor her as without her the chances of the hive surviving and thriving are slim. After placing the inner cover in position, I then added a feeder filled with sugar water. 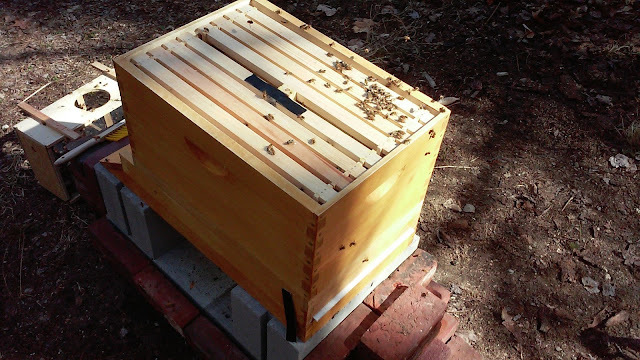 Then I put the hive lid on and placed the shipping package with a handful of straggler bees near the hive entrance and gave them some space until the morning. The next morning I took a quick peek into the top box that held the feeder, it was early and still pretty chilly so they were not very active but as you can see they were finding the nectar which will help them produce plenty of beeswax comb in preparation for the queen to start laying. Here is a video from this afternoon where you will see the hive buzzing with activity. I was excited to work on some garden projects while the hive oriented itself to our surroundings. First on the list of planting this weekend was some Bloody Dock Sorrel... its a perennial that takes a year to really establish but its a good deer deterrent and I have always enjoyed its bitter, citrusy flavor. Its a great garnish for fish or a nice addition to some hot weather salads ! From there it was on to the peas and salad greens... I knew I wanted to use the log cabin style bed as I watched the way the sun passed over last summer and this spring so it seemed a good fit for a trellis. 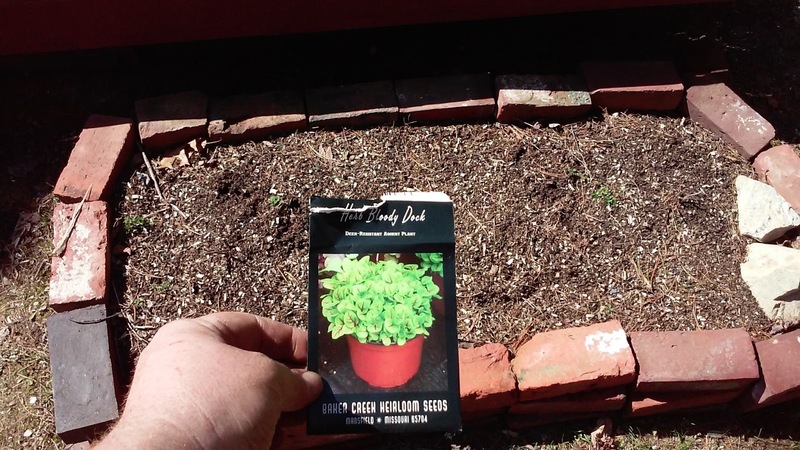 I am trying to rotate and succession plant a little better this year... plans are the peas will be replaced by cucumbers which will also benefit from the trellis as well as provide some shade to the rotation of salad greens as the summer heats up. I added a dressing of fresh compost and graded the bed gently with a bow rake. Now I had to figure out what to use for the trellis... my first thought was a grid of twine, but after a little searching in the basement and shed I had a better idea. 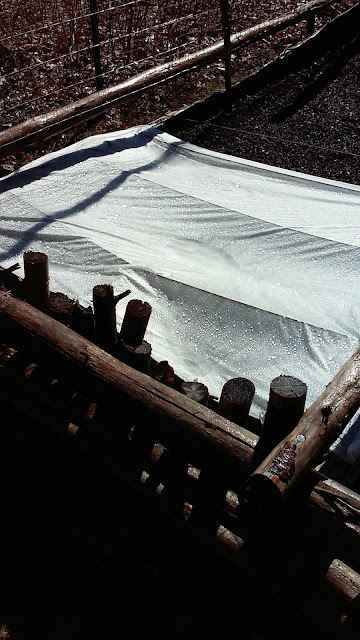 I found a leftover roll from the fence we constructed last summer and after unrolling it I had just enough to run a twelve foot span along the raised bed. Then behind me I remembered a small beech tree that I had chopped down last weekend to make a little more room for the slowly evolving compost bin system. After sawing that into a couple 7 foot sections and sharpening the bases into stakes with my hatchet it was all coming together. I pounded the 7 foot stakes into the ground and secured them to the raised bed with a few screws. Using a roll of stainless steel wire I then cinched the wire fence to the stakes and the final outcome seems like it should work quite well for peas and cucumbers ! 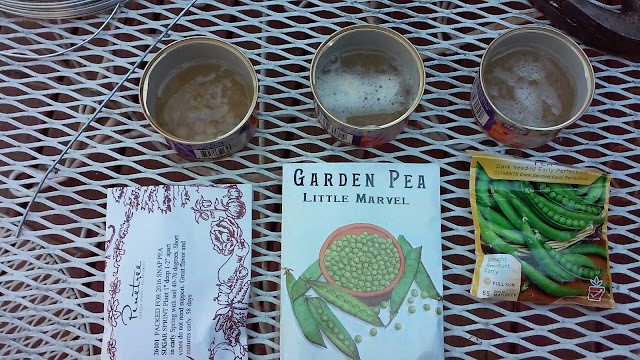 I soaked the peas I was ready to plant for a few hours in a solution of fish emulsion and warm water. The final planting was a straight 12 ft row with 76 peas planted. Along with the peas I also sectioned off five different areas to start the bed of salad greens ! Still making great use of that Benson's organic surf & turf compost mix and that makeshift bin I constructed last fall held up over the winter ! and I had to put one grape vine in the ground this Spring, and Elvira was her name. We also uncovered the garlic from the leaf mulch that we placed over the winter and were excited to see what appears to be every clove sprouting away ! I snagged a bale of straw that I hope to be able to dress the bed with this week to keep any weeds from becoming an issue as the growing season warms up. Another fairly large task that I got made some progress on and have a few scratches to prove it was pruning back the brambles. They seem to not have been dealt with in many years and have spread like wildfire. Im trying to cut all of the canes back only leaving a few of the healthiest and strongest. Hoping over the next year or two to create a nice natural fencing along the soon to be fruit tree patch with the remaining canes,but this is a battle that will be long and arduous. Well that is my weekend update from this week. Quite productive and my limbs feel like they got a good workout. More seedlings to start this week, getting a little behind but without a greenhouse just yet Im looking at six weeks of seed starting for my tomatoes, eggplant and pepper which I am hoping will all be started by the middle of this week and planted around Memorial Day ! 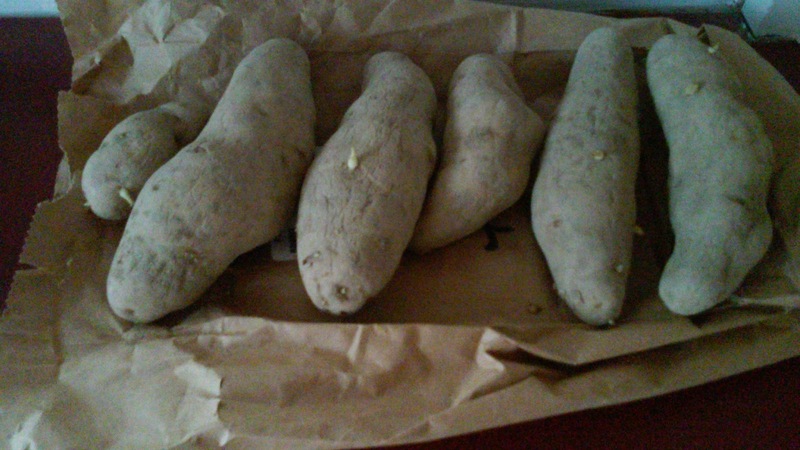 Till then I leave you with the fingerling potatoes that are prepping to plant as the eyes form this week.